This fun and fashionable pattern is representative of the late 16th century and early 17th century garments worn by upper class women in the royal courts and peasant women in their daily lives. 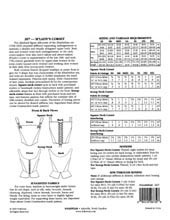 Square-neck corset laces in back with purchased and handmade eyelets (instructions inside pattern). 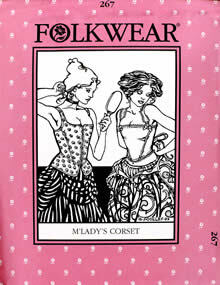 Scoop-neck corset fastens in front with purchased hook-and-eye tape, and features a peplum that echoes the waistline tabs of 16th-century doublets and corsets. Both versions feature the Elizabethan-era dropped center front waist. Make the scoop-neck version one or two sizes larger and wear as a vest. Pattern includes historical notes and a resource list. Misses Extra Small to 3X-Large.